It is interesting how in every place one lives in, there are certain foods found more commonly in that location. In the Southern part of the United States, this might be okra, iced tea and hush puppies. In the United Kingdom, this might be minced pies and mulled apple cider. In this part of Canada where our family is living now, I’ve noticed that the rhubarb pie seems to be featured at nearly every potluck or dinner event. I’m not complaining as it’s delicious, but it has caused me to look more closely into this delectable vegetable. Yes, that’s right. Even though rhubarb may have a ‘fruity’ taste and is often found in desserts, jams, jellies and sauces, it is actually a vegetable. But beware, only the stalks of this plant should be eaten, primarily because the leaves contain a high oxalic acid content. So what’s in rhubarb? 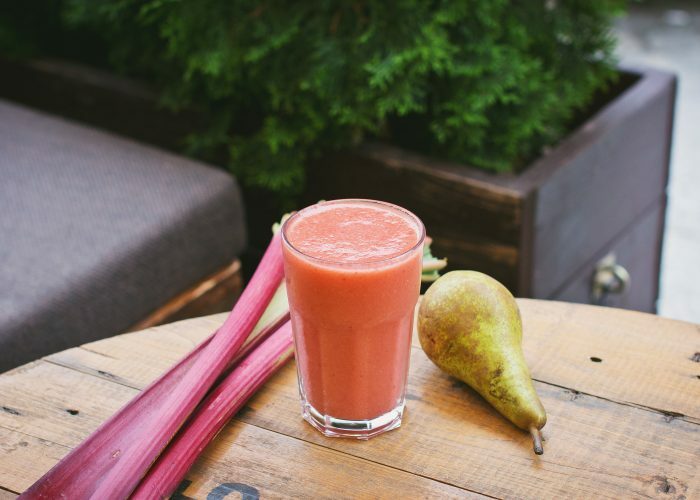 It turns out that rhubarb is rich in many nutrients such as protein, calcium, potassium, vitamin K. Just one cup of diced raw rhubarb (122 grams in weight) provides 26 calories, 1.1 grams of protein, 2.2 grams of total dietary fiber, 105 milligrams of calcium, 0.27 milligrams of iron, 351 milligrams of potassium and 35.7 micrograms of vitamin K. It also provides small amounts of vitamin C, B vitamins, vitamin A, vitamin E, zinc, phosphorus, magnesium. Its calcium content is equivalent to nearly two and a half cups of raw chopped broccoli! To compare, one cup of broccoli (91 grams in weight) provides 43 milligrams of calcium. Since rhubarb has a tart acidic flavor, it is often sweetened with a lot of sugar or honey before incorporating into desserts. However, instead of adding a lot of sugar or honey, try combining this vegetable with sweet fruits like apples, pears or strawberries to add to ice-cream or baked desserts. Alternatively, use unsweetened rhubarb to make into sauces for savory dishes. USDA National Nutrient Database for Standard Reference. http://ndb.nal.usda.gov. Accessed July 26, 2017. Ipatenco S. Can You Eat Rhubarb Leaves? www.livestrong.com. http://www.livestrong.com/article/491897-can-you-eat-rhubarb-leaves/. Updated July 18, 2017. Accessed July 26, 2017.